Is Owning a Vending Machine Profitable? 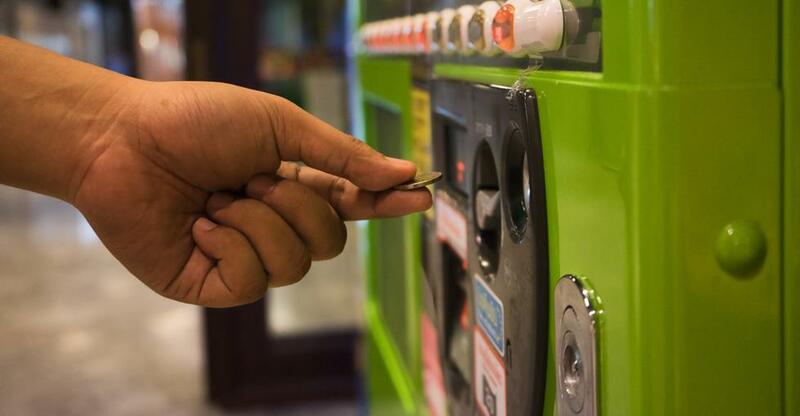 Owning a vending machine is the hands-off business which can make you money around the clock. Vending machines are autonomous money-making robots — all you have to do is plug one in and it will print greenbacks. Okay, it’s not all that simple, but it is true that vending machines are low maintenance entrepreneurial opportunities which can bring in real profit. There are just a few caveats. There are a few questions which could threaten the viability of vending machines in the modern age. Can a business which relies almost exclusively on impulse purchases be sustainable? What’s more, as technology advances, and with near-instant meal delivery a mere app purchase away, do vending machines have a fighting chance in the coming years? The short answer is this: vending machines aren’t going anywhere anytime soon. You don’t have to look further than a store, airport or bar to find a vending machine, which is a good sign of their continued profitability. However, there are a few things to know before you can turn a vending machine into a money machine. When it comes to vending machines, the normal criteria for business success go out the window. Classic qualifiers such as customer support, atmosphere, and more no longer apply. The success of your vending machine will boil down to only two primary factors: location and, even more importantly, product. From snack food to cigarettes and soda to DVDs, if there is an in-demand product there is undoubtedly a market for a vending machine. Products such as coffee, snack foods and soda will perform well no matter what. More specialized products such as hot foods, medications, and health items will depend on the location. Put yourself in the shoes of a consumer in any given location and use that impulse as your compass for which products will perform well. When it comes to owning a vending machine, location is everything. Vending machine owners soon find out that even the newest, flashiest machine is no match for poor foot traffic or theft. Your primary location consideration is simple: will your machine be seen by a large, relevant customer base? Not only is it important to get as many people in front of your machine as possible, but it’s equally important that those people match your target demographic. For example, if you set up a candy machine in front of a gym, you’re unlikely to get much business. Safety is another important vending machine location consideration. As a vending machine owner, you will not be around 24/7 to monitor your investment, so you have to have extra trust that the location is secure. Research area crime statistics to find locations least susceptible to crime or vandalism. Start from scratch — This option is the most expensive but also offers the most flexibility. You will need to find a location and buy a machine on your own. And, while most prime vending machine locations are taken by now, if you’re able to find a hidden gem, you’re likely to do well. Buy a franchise — Just like many other businesses, you can buy a vending machine franchise. This comes with all of the perks of franchises: established branding, stable business model, customer loyalty, etc. However, you’ve got to take the bad with the good: franchises take a percentage of profits and restrict your location and product options. Buy an existing vending machine — When you take over an existing vending machine business you can benefit from the initial success of the previous owner and avoid any lapse in revenue. However, this option requires significant upfront legwork with research, scouting, meeting owners, etc. Buying a vending machine, which has already proven profitable, is often the best way to enter the industry. After you find the right location, you will need to sign a contract with the property owner. Most property owners require a cut of gross sales to make up for costs like electricity. This, as well as sale guidelines, agreement length, and more will be outlined in a contract between you and the property owner. Vending machines are a profitable hands-off business which appeals to busy entrepreneurs and armchair moguls alike. There is as much opportunity in owning a vending machine as there is variety — you just have to think outside of the box. As long as you pair the right product with the right location — at a fair price — you really can make money while you sleep.